Are you following a LCHF diet but not succeeding with your weight loss goals? Then keep reading. Weight loss is both extremely simple and extremely complicated at the same time. On this page I have tried to gather some of the most common “mistakes” I often meet or hear about. There is no one way to success here. Patience and perseverance are the two single most important elements of your weight loss. If you do something half or only half of the time, you can’t expect full results. However, weight loss does not require a 100% compliance either. There are plenty of room for less than 100% but only you know, how many deviations it takes for you to get off the path that leads to your goal. So check out these 10 points. Maybe some of them speak to you. 1. YOU’RE NOT EATING LCHF! You liked some of the ideas about LCHF but you decided to make it your own from the beginning. So you kept eating your low fat yoghurt for breakfast and to have a few pieces of fruit during the afternoon. Nothing wrong with eating yoghurt or fruit but it’s not LCHF. So why not dedicate a few weeks to a month to LCHF and to sticking to the actual rules. Once you’ve done that, you can start making it your own and see what affects your results. Read more here: What is LCHF? Maybe you’re not as low carb as you think you are! Try to take a closer look at what you actually eat during the day. Somethings like nuts and dairy can easily tip the scale. Aim for 50g carbohydrate per day and if that doesn’t give you any result, try 20-30g. It can seem crazy that not eating enough fat is what is stopping you from losing weight. But by not eating enough fat, you won’t feel as satiated and full and you’ll be more temped to snack in between meals. Maybe you’re still in the restricting mindset telling yourself to hold back a bit. But that strategy is failing you and you’ll end up eating more than you would have, if you had just allowed yourself to eat enough fat with your meal to begin with. Instead, try eating more fat with your meals and see if that doesn’t help you eliminate mindless snacking. The reason you were attracted to LCHF was for all the divine desserts you can suddenly make now that butter and heavy cream are on the “allowed list”. But guess what? Cakes are still cakes and not many few people can lose weight by eating low carb brownies every day. I wish I could tell you differently. As with any other diet, cakes should play a minor role when you’re trying to lose weight. How often you can have cake without it affecting your weight loss efforts is impossible for me to say. I could have just started with this point because basically if you’re not losing weight, you’re not in a calorie deficit. Calories are still king when trying to lose weight. Keeping carbs low is just a means to make it as effortlessly as possible. Keeping carbs low will normalize your blood sugar, regulate your appetite and eliminate cravings and it will be much easier for you to eat according to the signals your body is sending you. I don’t believe in calorie counting as a means to lose weight but that doesn’t mean that calories don’t count. That your food is low in carbs is not a free pass to eat incessantly all day long. This one goes hand in hand with the one above. To learn to eat just three times per day and to eliminate all snacks is perhaps the simplest weight loss advice you’ll ever hear. You don’t have to go hungry between meals (though hunger isn’t dangerous). Both your weight, your metabolism and your digestion will enjoy to have longer breaks from the constant stream of food. French women are often admired for their slim waist lines. Many people claim that it comes from really enjoying the food, they eat. I think it also comes from the fact that snacking in between meals is a cultural faux pas in France. But that’s just my humble opinion! You weigh and measure every bite that crosses your lips or you track your macros to get the “perfect macros” every day. Food items are either “good” og “bad, “allowed” or “forbidden” and you feel terrible if someone serves you a salad with carrot or other root vegetable. There’s absolutely nothing wrong with being enthusiastic about your diet but it’s not meant to be this hard. This is a lifestyle change that will make you lose the weight once and for all. As long as you track everything you eat, you’re dieting. And diets don’t work. By controlling every bite you eat and relying on an app or some system to tell you what to eat and how much, you risk to lose touch with your body’s signals. And in order to solve your weight problem permanently, you need to be able to hear what your body is saying to you! Every morning you weigh yourself and you let your weight dictate how you feel about yourself. If the weight has not gone done, you feel useless and you look at yourself in the mirror while you say bad things about your body and opt for the chocolate at the first given opportunity. Or maybe you did lose weight and when the afternoon comes, you decide to celebrate with chocolate. Either way, you lose! And not in the way you were hoping to! So consider not weighing yourself that frequently if you experience that either result get you to make bad choices later in the day. Use a measurement tape and take body measurements instead. Not every day or every week but maybe once a month. I do hear of people who do well with the weighing every day deal. Instead of letting the daily result affect their mood, they accept fluctuations for what they are (fluctuations!) and they use their daily weigh ins as a means to see where the general trend is going. Maybe you really do do everything right and the weight still won’t come off. In that case my guess goes out to your metabolism. Years and years of trying to lose weight by going lower and lower in calories has put your body in a metabolic mess. What you need is to make your body feel safe again. Convince it that you’ll never starve it again, that you’ll take care of it from now on. Every day from for the next few months before you try anything like restricting calories again. But won’t you gain weight then? Perhaps! But you cannot live on a 1000 calorie diet for the rest of your life, so you’re better off fixing those metabolic issues while eating plenty of food. 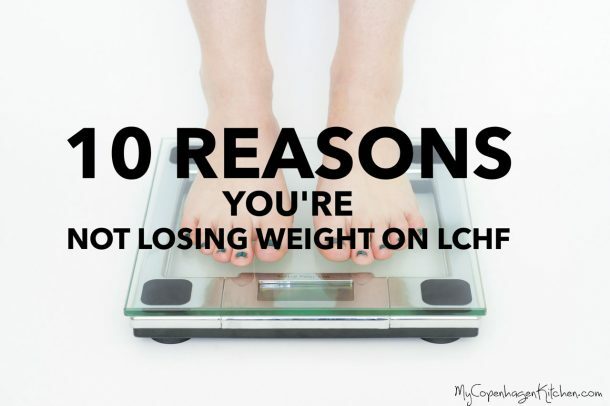 There are tons of reasons for not losing weight on LCHF (and any other diet). Maybe your body is stressed out, maybe you take medication, maybe your hormones are out of whack, maybe you cheat too often, etc. Or maybe you don’t need to lose weight at all! Maybe you’re just fighting against those 3-4 kilos that most women spend a lifetime trying to lose. Have you ever considered that maybe they’re meant to be there? That your body thrives better with them on it? Why else do you gain weight back like a boomerang, every time you succeed in losing them? I know this is a very old fashioned statement these days but I think it’s worth considering. For the same reason, I’m against all crash diets and I believe truly and deeply in lifestyle changes as a solution to pretty much every weight problem. So think about that the next time you feel tempted to fall for the “lose 10 kilos in 10 weeks” ads.